the 7th of December already and I haven't posted in quite a while again, but I finally have my memory purse done and have gotten rave reviews from those who have seen it!! Now, it is fairly small inside and I can't carry much but then maybe that's a good thing!! I'll post a picture of it later this weekend after I take a picture of it. Anyway, the holidays are upon us and I've been busy trying to design my Christmas card this year. Here are a few that I have come up with. I designed these to show at my last workshop to show how you can make 2 completely different cards with the same stamp set......Simply Christmas. 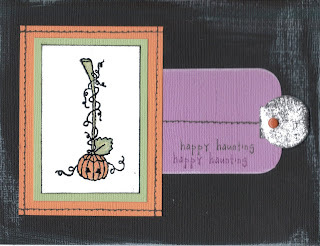 Both cards use Bazzill cardstock, stickles (one of my favorite embellishments), ribbon (another of my favorite embellishments), and versamark ink pad (the BEST ink pad to have at your fingertips). 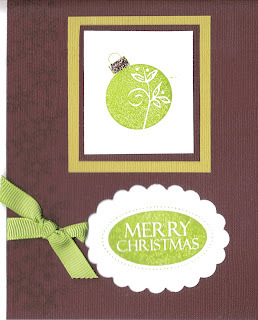 Now the ornament card uses a scalloped oval punch that is not TAC product but I absolutely love this thing!! The "Merry Christmas" that you see is actually in the inside of the card but shows through to the front via the scalloped punch!! The reindeer card uses the technique of paper piercing which I have just recently been doing a LOT of. 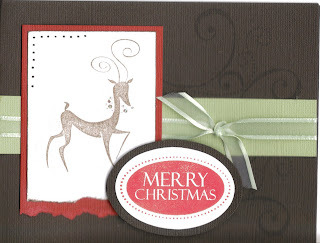 It also uses the technique of "stamping off", you can't see it at all in the picture but the reindeer is actually stamped twice, once and then again not inking the stamp the second time. 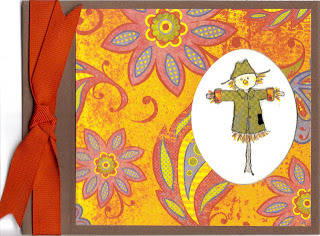 For this card, I got out my coluzzle templates to cut the ovals for the "Merry Christmas". This card really 'pops' in real life!! Well, I hope that these give you some inspiration this holiday for making your own handmade Christmas cards!! Remember, people tend to keep the handmade ones!!! Supplies: The Angel Company except for the oval scallopped punch and ribbons. Cha Cha paper. This collection offers 5 sheets of rich patterned paper and a sheet of coordinating tags that you can embellish your cards or scrapbook pages with. All for just $6.95. This special features a limited edition Christmas saying stamp set and the Merry Wishes Soar with It collection all for just $29.95. This is a GREAT price!! But you'd better hurry since this special only lasts until the end of November. Another special is that TAC has extended their DOUBLE hostess benefits until the end of November!! Drop me an email if you would like to order anything during this time (GWP's are also double too!). TAC also has their Stamp of the Month for November and the Vintage set available for purchase too!! 48 Lyra Aquacolor crayons!! I couldn't believe it when Lori pulled my name of the sack. I have been wanting these for some time now (I already have the 24 Lyra Aquacolor crayons) and actually almost bought the set of 48 at the beginning of last week and decided to purchase the Memory Purse instead. 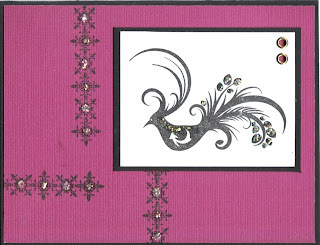 I will post a picture of the Memory Purse once I get my scrapbook page completed. I can't wait to showcase TAC products on this purse and I will be sporting my "bag tag" that I made for seminar 2007. Thanks Lori for the crayons!!! You ROCK!!! Boy, am I glad that Halloween is over but now that TAC has extended their Celebration promotion, my busy schedule will continue!! I couldn't have asked for better news for my customers. DOUBLE BENEFITS continue for the entire month of November!! So it is not too late to schedule your workshop or a catalogue show with me. This is wonderful news for my dear friend, Dena, who had a workshop scheduled for Sunday Oct. 28 but came down with vertigo and couldn't get out of bed. Long story short, one hospital stay later, she's feeling better and we now can continue with her workshop and she will still get DOUBLE benefits!! Thank you TAC!!! Here is a picture of my kiddos in their Halloween costumes!! Yes, I made the pizza slice costume.......lots of bad words and headaches later, it turned out great and Brett kept saying, "Mommy, it was a success!" Gotta love 'em!! I just found out this past weekend at my upline's Wing Workout (Lori Betterley) that I was published in the Nov./Dec. 2007 issue of Rubber Stamper!!! (Thanks to Lori for submitting my card.) So if you have a copy check it out. I am so honored to have been published in this article with a fellow friend and angel, Awna Stark. 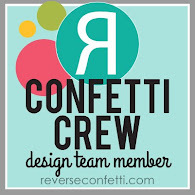 Check out Awna's blog as she has some awesome ideas and projects!!! 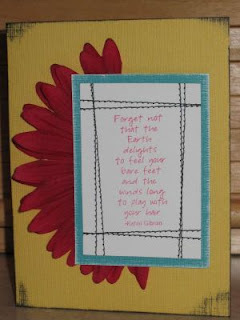 For a quick inspiration idea, here is a card that Lori had as a project at her Wing Workout. I actually like this set now. I have tried several times to make something with this set but just haven't had good success. This card could be adapted with other color schemes as well. Christmas anyone??? 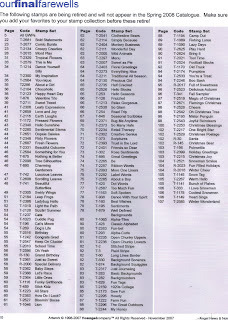 As a new catalogue season is just about upon us, TAC has released their Final Farewell list of retiring stamps as of Dec. 28, 2007. If I have counted correctly, I will be losing 42 stamp sets that are retiring!!! Boy am I going to have to go through my stamps and have a MAJOR stamp garage sale!! Anyone interested in coming over??? :) Anyway, here is the Final Farewell list. 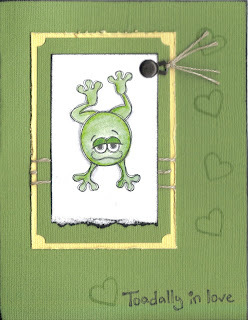 Here is a very cute card I made for my dh's birthday this week!! All Supplies from The Angel Company. 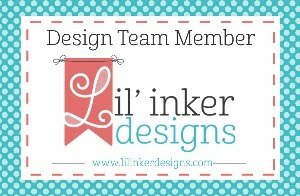 I will be off stamping ALL weekend so hopefully I will have some neat projects to share as well as new swaps!! I am currently in the middle of my many workshops this month and hope to get more projects and cards uploaded here soon. Did you know that October is DOUBLE benefit month with The Angel Company? Many have realized it and have booked an actual workshop and others have simply gone in with a friend for the "hostess split". This is where 2 people order $50 and then they "split" the hostess benefits. This means each of them would get 1 level A hostess set and 1 half price item. Let me know if you would like to reap these benefits!! 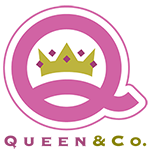 All products from The Angel Company. My first official blog entry!! Ok, here is my first official post!!! OCTOBER SPECIALS!!! Check out http://www.theangelcompany.net/ for details on these SpecTACular promotions!!! #4 Celebrate with DOUBLE hostess benefits!!! I have been getting ready for my October workshops that start here this weekend. Here is a hostess gift for this weekend. 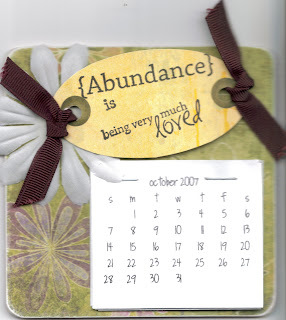 It is a chipboard coaster calendar/magnet.